A C13 church with a tower, almost entirely rebuilt in 1876-78 after falling into ruin. 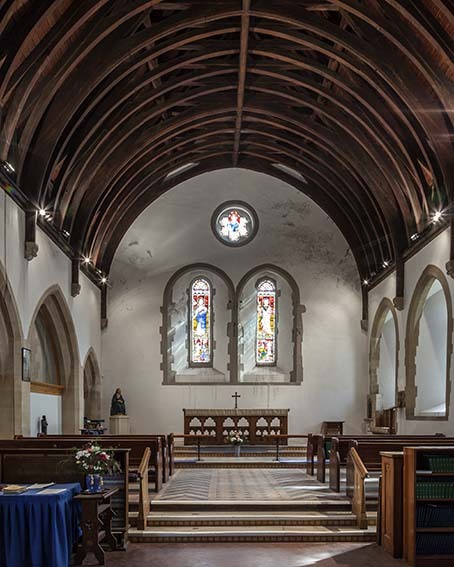 In 1931-36 a new chancel and nave were added to the north. Aldrington lies west of Hove and was sufficiently prosperous to provide two ships for Edward I’s Scottish wars (VCH 7 p457). The population declined after the C16 and by 1831 had sunk to two (Lower I p4). The fortunes of the church followed those of the village; a drawing of 1767 by James Lambert in the SAS Library shows almost every part of the church gone except the east end and much of the tower. However, although the Burrell Collection drawing (1772) shows it roofless, rather more seems to survive. From both depictions it is clear that the main fabric was C13, with lancets, including two east ones with a roundel over. Built of flint, there are neither aisles nor a division inside. Most of the tower still stood with single bell-openings; unusually, it lacked a west doorway, as is still the case. The lower part of the narrow tower arch survives today and shows that the tower was off-centre. By the date of the Sharpe Collection drawing (1802), only one lancet remained and little of the tower except the base. By the 1870s the coastal railway had been built and it was possible to imagine that the population of the village would grow rapidly, though this only happened on a large scale after 1890. Thus, in 1876-78 R H Carpenter and B Ingelow (B 34 p837) rebuilt the church, incorporating the existing ruins, particularly at the base of the tower. The new church probably differs little from the mediaeval one, though the new walling is distinguishable by its carefully knapped flintwork. The then north wall resembled the south one (Meads). The main change is the provision of double trefoiled bell-openings in the rebuilt upper stage of the tower. The east end was restored on the basis of the Burrell drawing, but with a sexfoil in place of the roundel. An apparently ancient carved stone, at the point where the rere-arches join, defies interpretation. Population growth, when it came, was rapid. 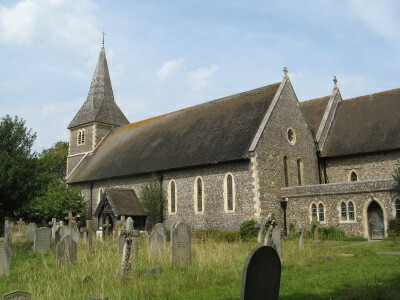 By 1900 Aldrington was joined to Hove and the church had become too small. J O Scott prepared designs for enlargement in 1906 (BAL/MSS ScJO/2/1), but despite a fire in the vestry in that year (CDG 156 p174), nothing was done until 1931, when H M Pett built what became the nave to the north with a baptistery (ibid May 1931 p210), to which he added a chancel behind an arch in 1936 (ibid July 1936 p197). He also added the broach spire (BE(E) p260). Pett’s design is based on that by Carpenter and Ingelow, with boarded roofs and an arcade with square piers between the naves. Provision was made for a north aisle, but an arcade like the other remains blocked and the external wall is of bare brick. 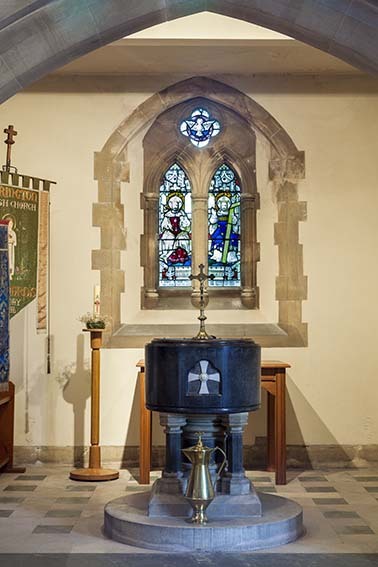 The low wall at the entrance to the chancel is by J L Denman and dates from 1954 (ESRO Par 228/4/1/10). 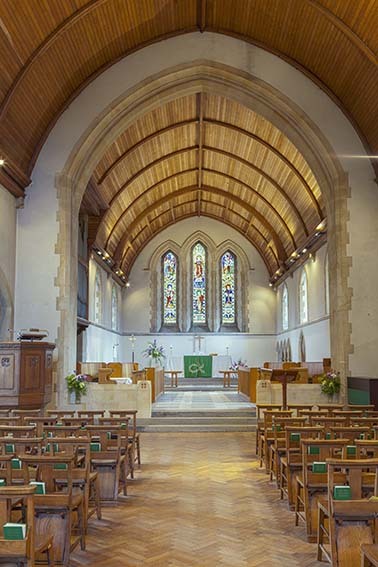 J K Wearing of the same firm designed new chancel fittings about 1970 (ibid Par 228/10/4/4). In 1998 various alterations were carried out including the reconstruction of the timber south porch of 1876 and the arcade between the old and new churches was blocked, with glazing in the upper portions. This allowed the old church to be used for community purposes (Church guide). 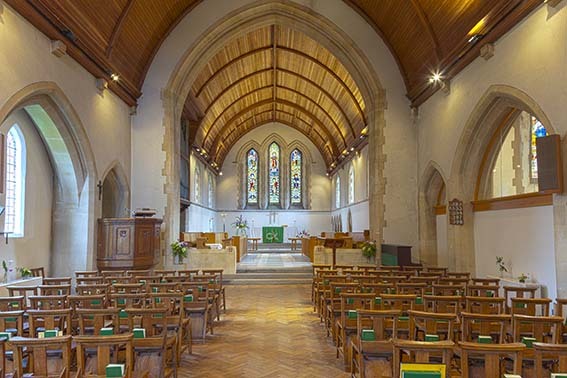 However, following the merger of the parish with that of St Philip in 2010, doubts emerged about the viability of St Leonard’s, though it remains in use (2018). Font: An octagonal bowl of black Derbyshire marble standing on shafts and decorated only by an inset white cross. Made by Poole and Son of Westminster, 1876 (B 36 p682). 1. 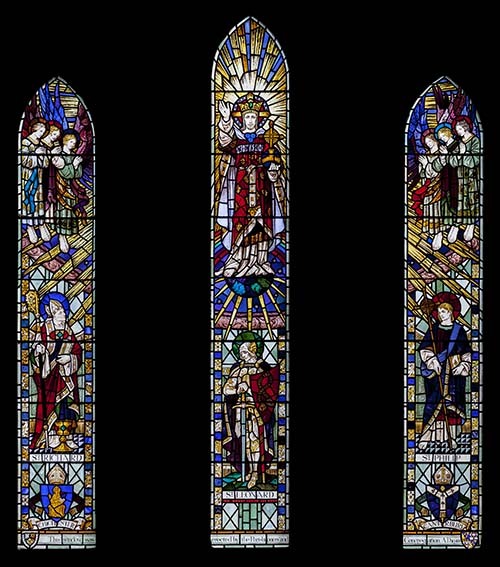 (East and west windows of old church) Clayton and Bell, 1878. (www.stainedglassrecords.org retrieved on 4/2/2013). 3. 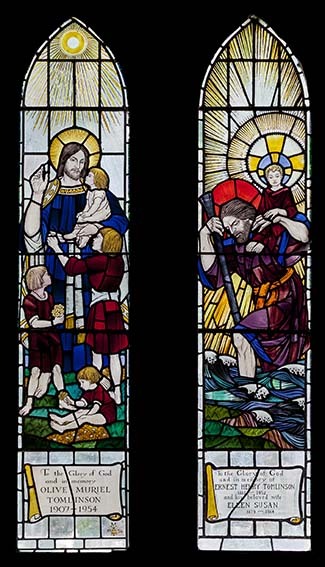 (East window and two-light north one in the baptistery of the new church) R O Bell and M C F Bell of Clayton and Bell, 1937-1955 (DSGW 1958).